Johannesburg - Cyril Ramaphosa’s victory in a gruelling battle to lead South Africa’s ruling party may have been the easy part. His narrow win and his allies’ failure to secure three other top posts is likely to delay his ascendancy to the nation’s presidency and plans to revive a stuttering economy. While Ramaphosa won 52% of the vote for the top post of the African National Congress, edging out Nkosazana Dlamini-Zuma, President Jacob Zuma’s ex-wife, David Mabuza and Ace Magashule - who’ve been Zuma allies - took the positions of deputy president and secretary general. Ramaphosa will be the party’s presidential candidate in the 2019 elections, but the close race reduces the odds that he’ll replace Zuma as the nation’s leader soon. Zuma’s rule has been marred by scandal, alleged corruption and policy missteps that dragged down support for the ANC and cost it control of Johannesburg, the economic hub, and Pretoria, the capital, in last year’s municipal elections. The 75-year-old president has fended off repeated calls to resign with the aid of his allies, including Mabuza and Magashule, who dominated the party’s previous National Executive Committee. 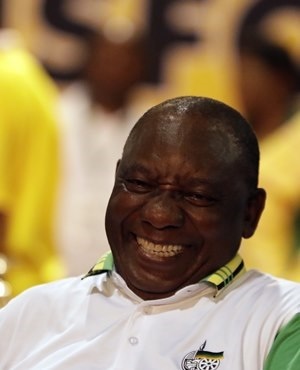 Ramaphosa, 68, won’t be able to act on his campaign pledges to boost the growth rate to 5% by 2023, restore investor confidence and tackle graft until he takes over the reins of government and appoints a new cabinet. Zuma has said he’ll only step down early if the ANC tells him to. While Mabuza previously aligned himself with Zuma, his support may have swung the election in Ramaphosa’s favour and he could back a move against the former president. Much depends on who’s elected on Tuesday or Wednesday to the 86-member National Executive Committee, the party’s top decision-making body between conferences that are held every five years. Ramaphosa downplayed the impact of divisions among senior party officials. For now, the financial markets appear confident Ramaphosa can cement his control over the divided ruling party and the country. The rand has gained 7.4% against the dollar since the start of the month, the best performer of 16 major currencies monitored by Bloomberg. Nicholas Spiro, a partner at London-based Lauressa Advisory, which advises asset managers, said the optimism may be overblown. Coleman, at Goldman Sachs, said Ramaphosa’s chances of putting the country back on track shouldn’t be written off. “Whilst a Ramaphosa clean sweep would have given him a freer hand to effect a decisive economic recovery, the outcome is still better than it otherwise could have been if he had not prevailed,” Coleman said.